The national Capital has been put on a high alert ahead of the Republic Day. The Delhi police has requested residents of the city to be careful and vigilant about the activities taking place around them. Intense cold wave conditions continued in the Capital today with minimum temperature dipping to 2.6 °C. A minimum of 2.6 ° C, five notches below normal, was recorded this morning compared to yesterday’s 3.8 °C, Met office said. National vice-president of the Bharatiya Janata Party Mukhtar Abbas Naqui today called the Congress government in Delhi as a government of sealing, billing and killing. The Delhi High Court Tuesday directed the All India Institute of Medical Sciences (AIIMS) and its director to immediately release the personal belongings of its former public relations officer B.K. Dash that were allegedly seized by the management in 2002. As part of a drive to catch interstate wanted criminals, the Crime Branch has busted one gun-running racket in the Capital. Two persons Raj Pratap and Ajay Raj have been arrested in this regard. A speeding Delhi Transport Corporation (DTC) bus on Tuesday crushed an elderly man to death in southwest Delhi, making him the first victim of the state-run fleet this year. Children, who would receive the National Bravery Award on the Republic Day, today met Chief Minister Sheila Dikshit in the Capital. The Delhi Police has charged mobster Babloo Srivastava and his accomplice Fazl-ur-Rehman for threatening to kidnap a Delhi-based businessman for ransom. Jayshree Raghuraman, IAS of the AGMU cadre has assumed charge of the secretary social welfare and the recently created woman and child development department. The two-day workshop on the ‘Development of Framework for Media Scanning’ ended today in the Capital. The workshop was organised by the Association for Advocacy and Legal Initiatives (AALI). The national Capital has been put on a high alert ahead of the Republic Day. The Delhi police has requested residents of the city to be careful and vigilant about the activities taking place around them. “We request members of resident welfare associations, shopkeepers, private security guards, car dealers, property dealers, vendors, guesthouse owners, auto rickshaw drivers, bus drivers/conductors and parking lot attendants to inform about any suspicious activity that they come across,” said Rajan Bhagat, spokesperson of the Delhi police. “We request them to be alert, as they are present everywhere in the city and come across scores of people everyday. Every citizen is a useful source of information to the police and can help by dialling 1090 about any suspicious persons or activities particularly unidentified objects, individuals leaving behind bags/luggage or any unattended articles,” Bhagat told IANS. The Delhi Police is also keeping a vigil on small hotels in the city, seeking details of tenants from landlords and of Internet users from cyber café owners - especially in the wake of terror blasts in three Uttar Pradesh courts that claimed at least 13 lives in November, last year. The terrorists had used an East Delhi cyber café to send out a threat email minutes before carrying out the Uttar Pradesh blasts. The police has sounded a high alert in all 10 districts of the city and held many people in the past few days, mainly cyber café owners and house owners who have not furnished details of the Internet users and their tenants. The Delhi Police special cell, a wing dedicated to combat terrorism, has made elaborate arrangements and deployed personnel in all major areas. “We have deployed special commandos, both in uniform and in mufti, at all major places. 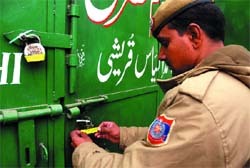 Special checks are also on at roads,” said Alok Kumar, deputy commissioner of police (special cell). Several roads in and around India Gate, through which the Republic Day parade will pass on January 26, have been blocked for security reasons. “We are carrying out regular checks of passing vehicles and have installed special closed-circuit TV cameras on certain roads, buildings, busy market places, interstate bus terminals, railway stations and some colonies,” a senior police official said. “Anti-aircraft guns installed at undisclosed locations would scan the horizon around the India Gate and Rajpath to engage any airborne target. Other hi-tech security measures are also in place,” the official said. Deployment of paramilitary forces at the airport and Delhi Metro stations has been beefed up. “We have increased the number of personnel both at the Delhi Metro and the Indira Gandhi International Airport. As the airport is an important transit point, we are checking every person at the airport and have instructed airlines not to allow liquid material on board,” said Vertul Singh, spokesman of the Central Industrial Security Force (CISF) that is responsible for securing the airport and the metro system. “The airport is being monitored and suspects are being questioned by our personnel. The aim is not to create inconvenience but to be alert and safe,” he said. Icy winds are blowing from the hills in northern parts of the country due to snowfall and are causing the dip in temperature, it said adding that cold wave conditions have been declared as the temperature drop is five degrees below normal. The minimum temperature for tomorrow is predicted at 3°C with the weatherman saying that the current spell is likely to continue for at least a day or two. Releasing a 24-page report (Sheila Sarkar nine years: achievements and failures? ), he said that during the reign of Sheila Dikshit government in the national Capital, citizens were upset due to the sealing of commercial establishments, inflated bills of electricity and fatal accident cases. Every state government is promoting industry and trade. But in Delhi, commercial establishments are being sealed in the name of unauthorised constructions. Consequently, lakhs of youths have become unemployed. The report was prepared by former union minister Vijay Goel. Naqui said that since privatisation of power supply in Delhi, people had been receiving inflated bills. They have to go pillar to post to get their bills rectified. Despite making complaints against the power companies, the government is not ready to take action. Chief Minister Sheila Dikshit issued statements to phase out Blueline buses due to their involvement in fatal accident cases. So far hundreds of people have lost their lives in accidents but the government does nothing. Vijay Goel said that in the party manifesto of last assembly elections, the Congress claimed that it would get full statehood for Delhi from the union government so that land, building and police come under the city government. Full statehood will also take over multiplicity of authorities like MCD, NDMC and Cantonment Board. Full-fledged state government can function in a better way. However, four years have passed, even a discussion on this issue has not been made with the union government. Interestingly, the state as well as union government both are being ruled by the Congress party, Goel pointed out. According to the report, the average demand of power in Delhi is 3000 megawatt while total production is only 2500 megawatt. In its manifesto, the Congress promised to install new power plants of 1000 megawatt in Bawana and 700 megawatt gas-based power plant in Indraprastha. But no step was taken in this direction. In such a situation how Sheila government will make Delhi a world-class city, Goel said. The report also pointed out a scam of Rs 12,000 crore in privatization of power supply. More than Rs 800 was spent in construction of Sonia Vihar water treatment plant to supply water to East Delhi and South Delhi. This plant is worthless as south Delhi is still dry. Delhi needs 10,000 buses but it has hardly 6000. Of them 4379 are Blueline buses. Now the government is claiming to replace Blueline by introducing low-floor high capacity buses. So far hardly 500 low-floor buses are on road. For how long the Delhi will see people being killed in accident of Blueline buses, Goel questioned. The government has no plan to improve transportation in the Capital. The government also claimed that jhuggi dwellers would not be displaced. They would be rehabilitated in multi-storeyed buildings to be constructed in the places where jhuggies existed. So far not a single building has been constructed, the report said. The court was hearing a petition filed by Dash, seeking release of his articles. The court asked the management of the prominent medical college and hospital not to harass Dash and release all his articles forthwith and fixed the matter for further hearing on January 24. Dash’s counsel Barun Sinha contended that the AIIMS management had been harassing his client since 2002 by sealing his belongings illegally at the behest of two previous directors, P.K. Dave and P. Venugopal. Submitting a list of articles before the court, Dash alleged that in October 2002 the management had illegally taken away his passport, PAN card, flat ownership documents and the Employees Health Scheme card when he was on leave. While following the recovery of a large number of firearms in the national Capital, the Crime Branch wanted to get to the source of the arms. Acting on a tip-off, police team laid a trap near Indraprastha Park on Outer Ring Road. Raj Pratap Saxena was arrested from the spot. Four countrymade revolvers were recovered from him. The alleged accused revealed that he had procured those arms from one Ajay Raj in Uttar Pradesh. Police team took Raj Pratap along and left for Rampur to get to the other accused. It was revealed that Ajay used to buy those arms for Rs 4,000 and would further sell them for Rs 6,000. The firearms were supplied to different parts of the Capital to be sold to several gangsters. Another group of gangsters has been arrested by the Crime Branch with a total of Rs 2.5 lakh as reward on their arrest. Alleged gang leader Manipal has been nabbed with three other accomplices Vikram, Praveen and Rajesh. Specific information was established that Manipal and his accomplices would pass through Najafgarh while on their way to kill their rival gangster Jasbir. One Santro car was signalled to stop at a check post in the area. Instead to stopping, the driver sped away towards Chawala. Occupants started running in different directions after their path was blocked by the barricades. However, they were chased and apprehended by the police party. Foreign-made prohibited weapons were recovered from the accused. US-based Indian environmental scientist Subijoy Dutta Monday offered a low-cost, high-result water cleaning technology to cleanse the Yamuna River in the city of the Taj Mahal. Founder president of Yamuna Foundation for Blue Water in the US and author of “Environmental Treatment Technologies”, Dutta told IANS of his passion and commitment to restore the pristine purity and glory to Yamuna river, one of the worst polluted rivers in the world. He has set up three centres along the Yamuna bank in Yamunanagar, Karnal and Panipat in Haryana to collect samples and constantly monitor the results of cleaning efforts by various governmental agencies and voluntary organisations. The fourth is to be set up soon in Agra. “Some of the tests - like for presence of carcinogenic hydrocarbons - can be done only with highly sophisticated technology available in the US,” Dutta said while interacting with the media at Goverdhan Hotel here Sunday evening. Dutta, who pays a visit and carries out tests every six months, said the Yamuna Action Plan, on which hundreds of million of rupees had been spent, has not made any difference and the river remains a stinking drain. “Obviously, there is need for greater involvement of citizens’ groups and volunteers for whom I have developed low-cost technologies which can remove 50 percent of the pollution load in the river, and thereby decrease our dependence on harmful water-treatment chemicals,” he maintained. Dutta says air diffusers and simple floating or stationery aerators, which can be operated by generators and available motors and pumps, would make a significant difference. “A simple diffuser would not cost more than Rs 10,000 and we can have a row of them over a stretch of 20 km. The oxygen content would definitely improve and solid wastes would be segregated and settle down. The water would be regenerated with oxygen and become healthier,” he said. “Even sprinklers can be used to improve levels of biological oxygen demand. All these simple mechanisms and their operators are locally available. All you need is the will power and determination. It’s here that smaller citizens’ groups can come forward and supervise the running of these simple devices,” Dutta said. 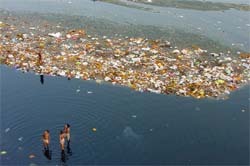 “In India people think it is only government’s responsibility to clean the river. If government agencies failed to deliver the promises made, as has happened in Yamuna’s case, can we keep sitting with our hands folded tight?” Dutta asked. At a conference on the Yamuna organised by Rivers of the World Foundation last week in New Delhi, Dutta outlined a 10-point strategy to revive Indian rivers, the chief being involvement of smaller groups armed with low cost technology and independent of the government pressures. Tara Chand, 72, was crossing the road at a traffic signal in Dabri area on Tuesday afternoon, when a DTC bus plying between Mangalapuri and New Delhi hit him. He was admitted to Deen Dayal Upadhyaya Hospital, where doctors declared him dead. “We have arrested the driver and the bus has been impounded,” said a police official. Last week an elderly man was crushed under the wheels of a privately operated Blueline bus, part of a fleet that has already killed four persons on the city roads since January 1. The youngest winner Yuktarth Srivastava, 6, from Chhatisgarh narrated how he saved his sister from stray dogs. He would receive the Sanjay Chopra Award. The CM appreciated the bravery of the children. She briefed them about the Capital’s glory and invited them to take a ride in the Delhi Metro, which has earned recognition at the world level. The special cell, an anti-terrorist wing of the Delhi Police, filed the charge sheet against Babloo and his accomplice, under the Maharashtra Control of Organised Crime Act (MCOCA), in the court of additional sessions judge B.R. Kedia, who posted the matter to January 29. Under the MCOCA, the police has to file the charge sheet in the case within 180 days of the arrest of the accused. Srivastava was brought to Delhi from Bareilly Jail in Uttar Pradesh on a warrant to present him in a city court. He was arrested July 27, 2006. The special cell of the Delhi Police had lodged an FIR under MCOCA against Srivastava and Fazl-ur-Rehman on December 29, 2006. The police alleged that the two were running an extortion racket in the Capital from 1983 to ‘97. The police arrested Fazl-ur-Rehman on August 6 last year from Sonouli near India-Nepal border for allegedly kidnapping another businessman and demanding ransom from his family. More than 40 criminal cases, including those relating to murder, extortion, kidnapping and attempt to murder, are pending against the duo. Raghuraman while elaborating her priorities stated that efforts would be made to ensure better outreach and enhance community participation in social welfare sector. Schemes like ‘Laadli’ would be implemented vigourously. “It will be my endeavour to give special focus on services related to woman and child development department”, she added. She is an IAS of the 1991 batch. She has served the Government of Delhi andGovernment of Goa in various posts. Around 30 activists from Haryana, Kerala, Madhya Pradesh, Maharashtra and West Bengal participated in it. The workshop aimed at developing a common framework for analysing the existing collection of media clippings related to the choice of relationships as well as the future media scanning. “The AALI aims at generating holistic response to the violation of women’s right to choice and decision making in sexual relationships,” said Niti Saxena from the AALI. Representatives from different states shared their experiences while dealing with the vernacular and national media. “Though we get to know about honour killings and other infringement of women’s rights through the media, the presentation of news is very problematic at times,” said Jagmati Sangwan from the All India Democratic Women’s Association (AIDWA). The workshop also passed a resolution condemning the killing of Manoj and Babli in Haryana. “We appeal the Chief Minister of Haryana to take appropriate action in the Manoj and Babli case to ensure justice,” said the resolution.